In today’s gold market, especially after the dismal 2013 investment season closed, investors are looking for ways to improve their ROI while still protecting their capital and finding ways to continue to improve their overall portfolio. While gold bullion is always a solid investment, especially in the long term, another investment in gold to consider is gold coins. While still somewhat tied to spot gold prices, gold coins have some advantages that bullion simply doesn’t have, including being a much stronger and a more stable performer than bullion was in 2013. Let’s look at gold bullion. Regardless of whether you’re looking at bars in 1 ounce, 10 ounce, 100 ounce or 1000 ounce quantities, the price you pay (and the price you’ll be paid) is directly tied to the current spot price for gold. Truth be told, it doesn’t matter if your bullion simply has the hallmarks for weight and for quality, or if the hallmarks include mint marks from a government mint or a private firm, the value is still directly tied to spot gold prices. That means if you buy gold at $1,300/oz and sell it at $1,800/oz, you’ve made a significant return on your investment. However, if gold does what it did in 2013, dropping some 25% from the high in January, 2013 to the close in December, you’ll have lost a significant amount of value. When gold is going up, it is a great investment. However, when the gold market is fluctuating heavily and prices drop because of external factors, bullion isn’t a good investment at all. Now, let’s look at gold coins. Gold coins, especially coins that aren’t designed to be a direct alternative to bullion, have a value based on many factors besides the price of gold itself. These factors include country of origin, condition, age and rarity. 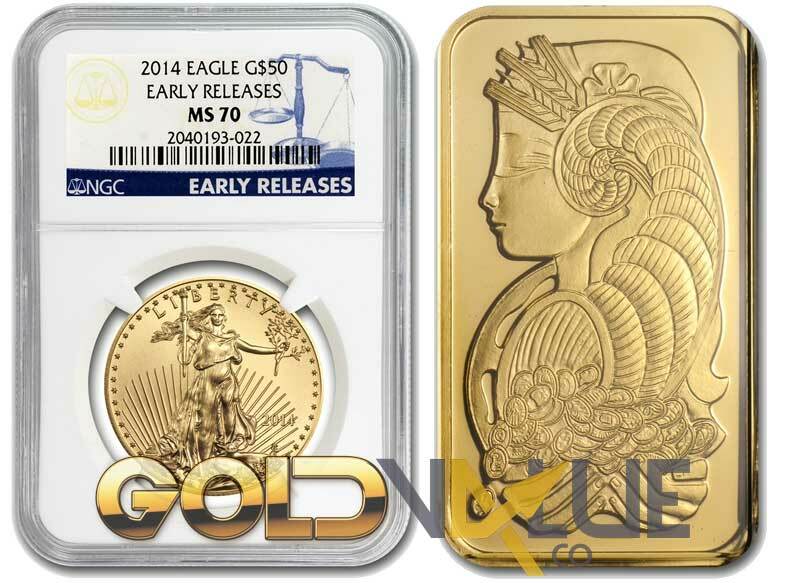 For instance, a 2013 $25 Gold Eagle MS69 is running in the $900 range, but a 1849 Norris, G & Norris Territorial California $5 gold coin in absolutely terrible condition (MS20) is running in the $7,500 range. Even more common gold coins such as the Liberty Head $20 Gold Coin in average condition (MS60) can range from the mid-$1,700 range all the way through the $275,000 range depending on the year and the mint mark. Even though gold coinage is tied tighter to gold spot prices than silver coins are, coins enjoy a much lower level of market volatility than gold bullion does. Unlike bullion, which can take dramatic price hits as was evidenced during April 2013, coins provide you with a much more stable investment platform. While the buy-in for gold coins is somewhat higher than for strictly gold bullion, coins rarely drop significantly in price and generally continue to go up, even when the gold market itself is weak. If you’re looking to extend your portfolio with investments that not only protects your investment dollars but will almost always provide you with a positive ROI, then gold coins will be a much more productive alternative to gold bullion. GoldValue.co is a precious metal news website that prides itself in providing gold market updates and live pricing. Our website is geared toward mobile and desktop users.